Detail of Champlain's 1607 map showing what is today Boston Harbor. Samuel de Champlain may have been one of the first Europeans to sight what is now Boston Harbor. 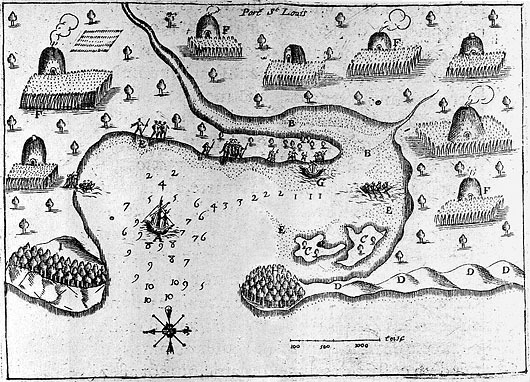 On July 17, 1605, Champlain described encounters with Native Americans nearby. During this voyage, a landing party disembarked near Nahant and named the River du Gas (present Charles River). The expedition then proceeded to Port Saint Louis, now known as Plymouth Harbor. Champlain mapped a number of Native American settlements along the coastline and at estuaries. Archeological evidence throughout the northeast suggests that people established large villages during the Late Woodland period, which began circa A.D. 900 and ended during the time of early contact with Europeans. "We saw in this place a great many little houses, which are situated in the fields where they sow their Indian corn. Furthermore in this bay there is a very broad river which we named the River Du Gas. In my opinion it extends toward the Iroquois, a nation at open war with the Montagnais who live on the great river Saint Lawrence." 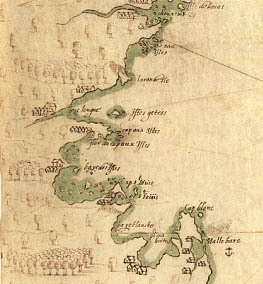 Champlain's map of Port Saint Louis at Plymouth Harbor, 1605. Archeologists believe that Native American communities gathered and shared food during the spring and fall, fished and hunted, and met for social and political gatherings. In the summer and winter months, people may have dispersed to smaller sites across the landscape. Archeology on the islands in Boston Harbor has unearthed a number of Native American sites, particularly along the south-facing sides of the harbor. Local people have speculated that these areas were popular for clamming. A decade after Champlain's journey, in 1614, John Smith noted seeing corn planted on the islands during his own explorations. Visit the harbor and islands to see how the coast has changed since Champlain mapped the French explorations. Learn about the cultural life of Boston Harbor in exhibits and tours. Find out about the maritime history of the Massachusetts coastline.